This time of year I always reminisce over the last 12 months - the good, the bad, the in-between. Many happy birthdays, new beginnings, lots of laughter, a few tears, new babies, those we've lost, new friends, longtime friends, new adventures...the list goes on. All in all, the year was good and I'm looking forward to all that and more in the coming year. So the countdown begins to the new year and Karen is the "Keeper of Secrets" in 2017! Stay tuned to see what fun we have in store. The first big secret will be announced on January 1st! Keep up with the daily posts on Instagram, Facebook and Twitter for all the news. As many of you know, Faye has moved up near Savannah to be closer to her daughter and her family. We are having a "Fayeday" Open House for you to come see Faye and wish her well on her new adventure. Mark your calendars for Saturday, January 7th between 10:00am and 2:00pm in our classroom. Just a friendly reminder to sign up at least a week in advance of class. We want to be able to give at least 5 days notice for teachers and students to plan accordingly. If you register and the class does not make, we will provide a full refund. Next quarter's Preview Party will be on Saturday, January 21st. The doors open at 8:30am and we will start the program at 9:00. Come check out all of the new classes we have to offer! 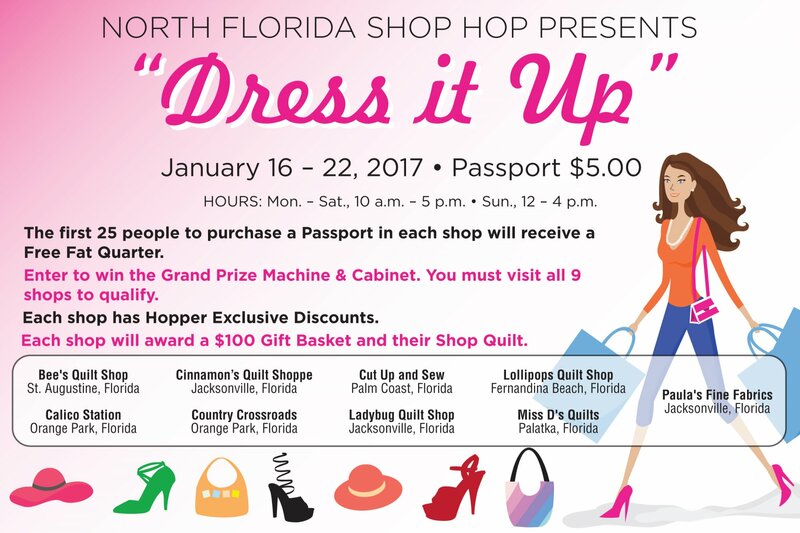 There's still time to get your passport for the North Florida Shop Hop coming in January 2017. The passport is just $5 until January 15th. Nine shops, Nine great blocks! 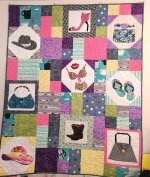 The theme this year is Dress It Up and includes applique blocks for shoes, purses and hats.